When you welcome a baby into your life, you can’t help but think a lot about his roots and his future. 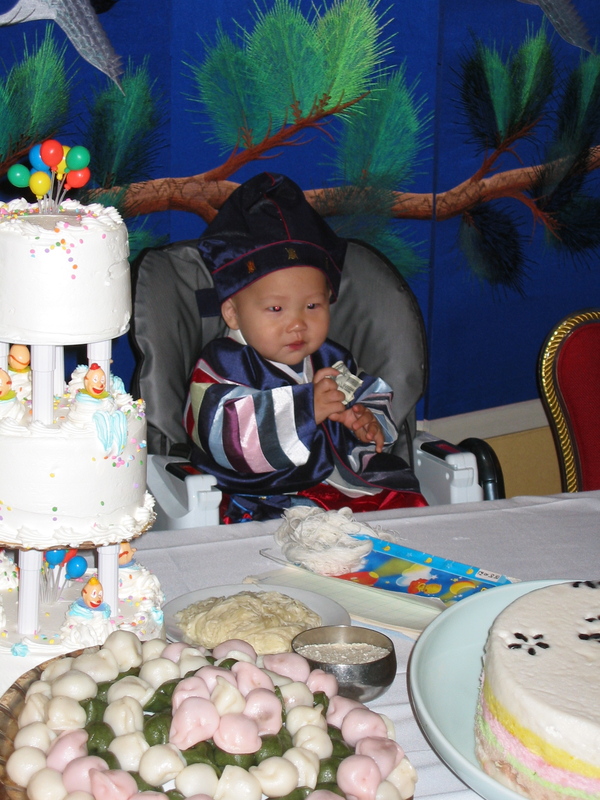 One special tradition that Steve’s parents introduced us to was the Korean first birthday celebration – the Tol (also called Dol). Even before our oldest son was born, his Harabuje and Halmoni (Korean grandfather and grandmother) were planning K’s Tol. This is a special celebration that originated in a time when infant mortality was high, and a baby reaching his first birthday was an important milestone. I didn’t know much about the Tol at first, but it became a sweet tradition that we continued for all three of our boys. With a few simple and meaningful elements, you can add this special event to your family’s memories, too! Steve happened to have gone on a business trip to Korea while I had been pregnant and he had brought home a traditional outfit (hanbok) for baby. Steve’s parents searched high and low and found the special socks and shoes to match. You can buy these in the US, too. 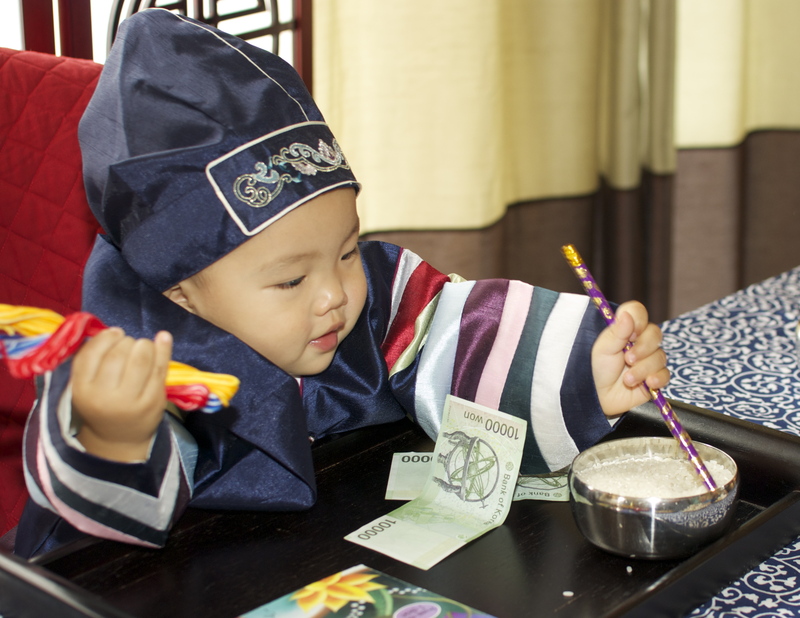 Here is a link to a baby boy Hanbok and a baby girl Hanbok . Harabuje (grandpa) helps birthday boy L adjust his Hanbok. Baby J wore a mix of his older brother’s outfits. There are even special socks and shoes! Harabuje and Halmoni hosted our first Tol in a private room at a Korean restaurant. It was a small event with family and a few close friends. The ritual of welcoming and honoring our young baby and his family seemed more important than putting on a display for others. 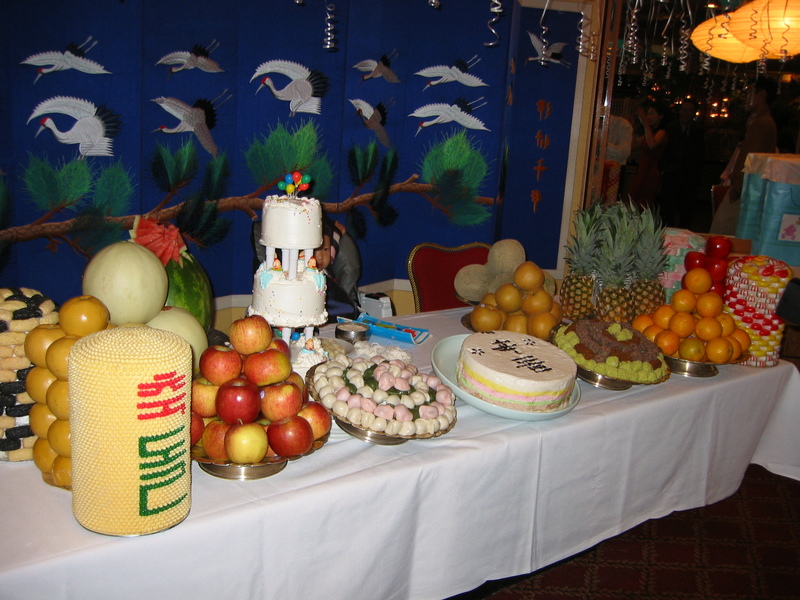 The main features at a Tol are the table set with an abundance of fruit and special rice cakes (called “duk”) and the Toljabee. After the restaurant party for K, we hosted L and J’s Tol celebrations at home. 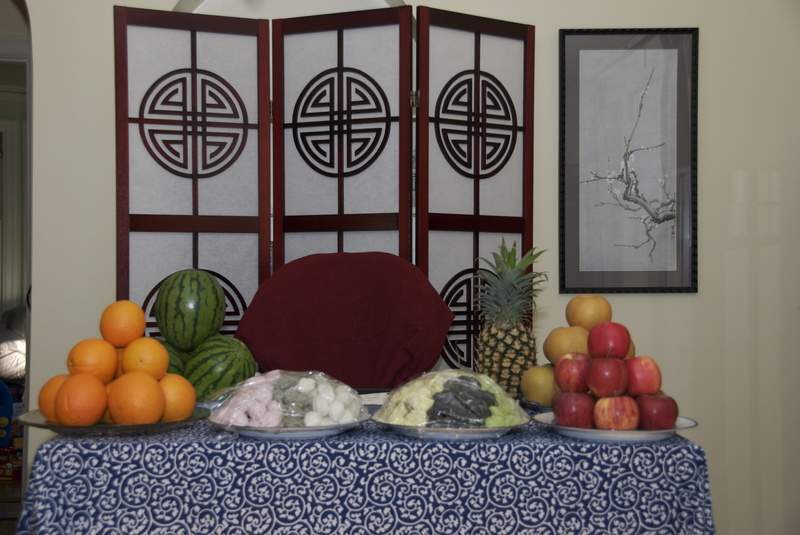 While the restaurant had a set of fake fruits and accessories, I opted for something more simple, setting the table with red and blue decorations and fresh fruit and rice cakes. Simple, familiar flavors always go over really well with a crowd (especially if there are some picky eaters among you). The Korean restaurant’s elaborate Tol table. Half those cakes and fruits are plastic – haha! Our home Tol table was more modest – but everything was real! In the Toljabee, the baby is presented several items that each symbolize some characteristic, and the items that the baby chooses are a prediction about his future. L was kind of hungry, and kept trying to eat the grapes. I wonder if that really means I have a lot of grandchildren to loo forward to! For our Toljabee at home, I assembled some symbolic items on a decorative tray. Embroidery floss or ribbon makes a pretty string! All of our Tol celebrations were small. We kept to a small group of family and close friends. A big party can be overwhelming for a little baby, and there will be plenty of bigger parties to come. If you are having trouble tailoring a guest list, try writing everyone’s names down. This can help you to see who really needs to be there. When L had his Tol, I mentioned it to his older brother’s preschool teachers, and they asked if I could teach his class of three-year-olds about this tradition. L became a living show-and-tell presentation, and we let each of the kids pick an item as part of the Toljabee. I also made a picture book for the class to teach them about the Tol tradition. This was easy to do with a photo book and some simple text. Shutterfly has lots of options for customizing a book to make almost anything you can imagine. I made an extra copy for our family, which I put out during J’s Tol, and it was very cute to see L request a reading from every adult in the family. I made a photo book to teach our kids and their friends about the tradition of the Tol. The first page of our photo book about the Tol. Looking back, we have a lot of special memories from these parties. Our kids tend to be more involved with their Chinese heritage, since they’re in a Chinese immersion school, and above all, their lives revolve around North American culture and interests, so I’m particularly glad to have included this Korean tradition in our family. While it was very important to Steve’s parents, it seems like a lot of other families didn’t know about the Tol, so it was also fun to share this tradition with our friends, and now, I’m excited to share it with you! 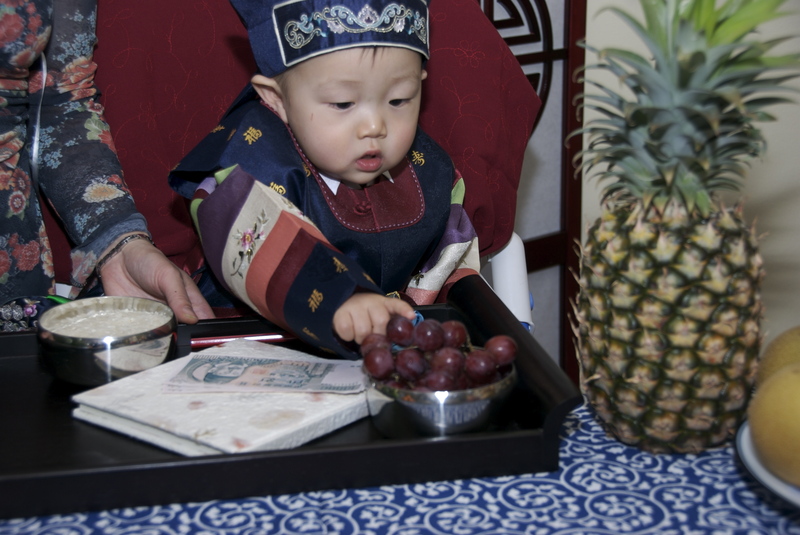 Do you have a baby with some Korean roots? This would be a beautiful event to hold for him or her. A lot of Korean restaurants are equipped to host a Tol, or it’s easy to do something simple at home. When I get a chance, I also want to tell you about our Chinese Red Egg and Ginger parties, and I’d love to hear about your traditional celebrations from other cultures, too!